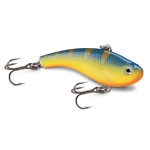 Rip-it and drop it or slowly bob a soft tipped rod up and down. 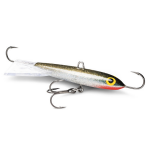 The Jigin Minnow will call fish in and generate strikes from both active and inactive fish alike. 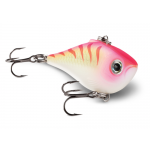 If this bait doesn't look a little familiar, you probably haven't been ice fishing much. 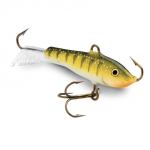 Suffice it say that baits with very similar shapes have been around for many years and catch everything from Perch to Lake Trout. 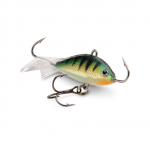 As you jig it up and down, it will swim around and around in a circle, tormenting all minnow eating fish. 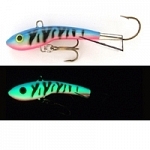 The Jigin Minnow has a very high-quality epoxy paint finishes. 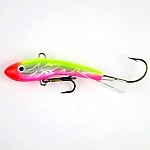 You will truly be impressed with the quality of these baits. 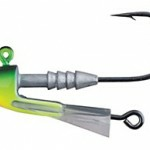 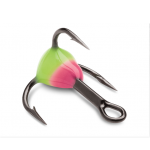 The business ends of this bait and lower treble are all Mustad hooks. 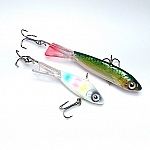 These baits are the same length as the #5 and #7 but weight in at a hefty 9/16oz and 7/8 oz respectively. 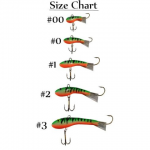 These were designed for you guys that fish large river system or the big waters like around the islands on Lake Erie were current can play havoc on staying vertical at times.